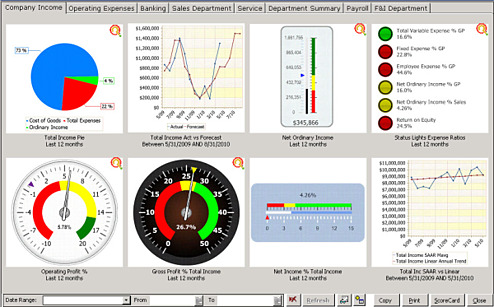 CleverQ executive dashboard software provides state of the art graphical analysis and representation of nearly any business metrics in one convenient place to monitor KPI performance. Data can be mined from multiple data sources such as Access, SQL Server, MySQL, Oracle, Excel, QuickBooks and other ODBC compliant data bases. Information which was once scattered in many different reports, spreadsheets, and data sources, can now be conveniently consolidated for analysis at a glance. User defined Business Metrics and KPI monitoring can be grouped into unlimited numbers of dashboards summarizing the performance of any sector of performance. Custom dashboards can be defined for multiple users and role based security ensures the right people see the right information. Drill down on any gauge to see graphs, scorecards, details, comparison to previous period, custom reports, or to another dashboard.